The team of Nimrod Long and Associates and garden designer Mary Zahl were chosen by the Aldridge Gardens Executive Board to refine a Master Plan for this 30-acre site. Purchased by the City of Hoover from retired nurseryman Eddie Aldridge in 1995 for use as a public garden, the gardens will showcase 15 to 20 different varieties of hydrangeas. 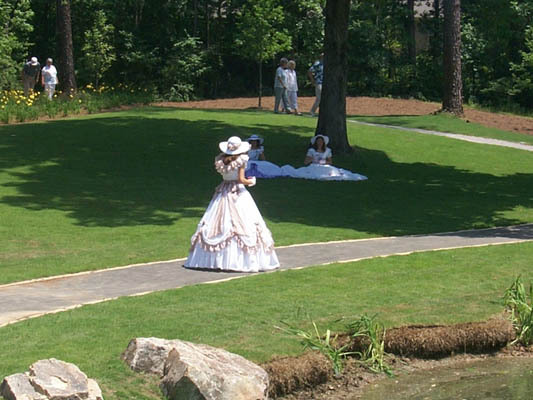 The initial phase of development included landscaping, small gardens and walkways around the former Aldridge house, which was converted for use as a meeting and special event center. Parking circulates one way and is angled to minimize paved areas and maximize the landscaped areas between them. Past the entrance, the road leads to a seven-acre crescent-shaped lake. The land forms a bowl around the lake, making the gardens seem secluded and private.